The Historic Centre of Santa Ana de los Ríos de Cuenca is an example of an inland colonial town, founded by the Spanish in 1557 on a green-field site. The town was established to support the agricultural development of the area. It is located in the Andean highlands at about 2500m above sea level, on a strategic position between Quito and Lima. 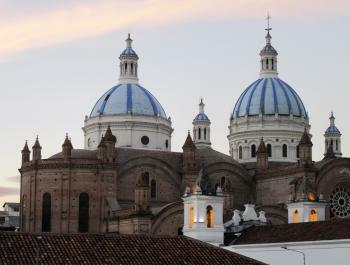 They just call it ‘Cuenca’ in Ecuador, but with the Spanish Cuenca also inscribed we have two WHS with the same name! So for the website I’m sticking to its full name: Santa Ana de los Rios de Cuenca. Looking at the current state of our connections, links, reviews (1) and photos (1) for this WHS, not many previous visitors found anything to write home about or even had a critical look at its specific site page. So with Cuenca being the first stop on my Ecuador trip, it’s now time for a makeover. Adding additional links proved to be hard. Actually none of the key attractions of the city has a functioning website. I found a number of blog posts from mainly Americans living in the city glorifying life there, but most were too shallow to warrant a link. I eventually settled for 5 Things You Can't Miss In Cuenca's Cathedral of Immaculate Conception. The best website about Cuenca still is the official one from the local tourist department. It does have comprehensive listings of churches, museums etc with their opening hours. I used it in planning my itinerary for the day, as it has so much more detail compared to what I had been able to find elsewhere. I easily found 11 additional connections to characterize Cuenca. The New Cathedral, the city’s main landmark, in itself is a rich source. It was designed by a German friar, has 3 blue glazed domes, Carrara marble on the floors and is considered unfinished (there should have been 2 more domes). I visited on a Sunday during one of the almost continuous masses. The huge church can hold 10,000 people and this number surely was present. There are video screens attached to the pillars so even from far the people can see what the priest is doing exactly. A connection ‘kitsch’ would be needed to further describe the interior of this New Cathedral. There’s a 3m high statue of Pope John Paul II for example that looks like a gigantic plastic doll. 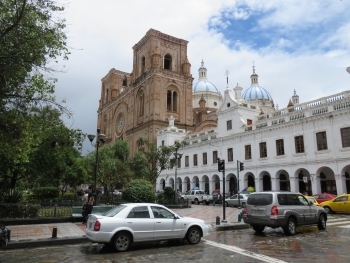 The World Monuments Fund (WMF) and the US Ambassadors Fund have been active in Cuenca. The WMF supported the renovation of the Remigio Crespo Toral Museum. It only finished in 2014 and so is missing from many guidebooks and websites about Cuenca. It’s worth visiting though and is free to enter. This former house of a poet shows you how the elite lived in the late 19th, early 20th century. I can disclose that they were fond of Paris. Both WMF and Ambassadors Fund spent their money at the Todos Santos Complex. It covers a historic church (with roots going back to 1540), garden and bakery. Unfortunately it was closed on the day that I visited Cuenca. Another notable location is Pumapongo. Pumapongo is the archaeological site that covers remains of the Inca city of Tomebamba. The story is that Tomebamba was already in ruins when the Spanish arrived, and that they choose to build their own city 2km away. I think we have to let go the connection Built over the ruins of an Incan city, as this was not technically the case in Cuenca (in contrast to Quito and Cuzco). Both are now enclosed within the modern city, which with 400,00 inhabitants seems to fully cover the valley. I found the ruins more impressive than I had anticipated. The site has a very straight canal running through it, with an “Inca" bath” at the center. Next to it they have re-created gardens, and there are manmade terraces that go all the way up to where the ceremonial center was. In all I had expected a little more from Cuenca. For me it did not live up to charming colonial centres such as Guanajuato (Mexico), Antigua (Guatemala) and Granada (Nicaragua). Maybe this is because of its fairly large size, or I was distracted too much by the rainy weather. The city had its heydays in the late 19th and early 20th century, and this period reflects more in its buildings than the colonial era. It has always been a bit of an outpost and did not see the riches of towns that experienced mining booms. Although it was rainy during most of my visit, I found the city of Santa Ana de los Ríos de Cuenca to be the most charming of the cities I visited on the Ecuadorian mainland this past June. I arrived at night, but the room in the former monastery I stayed in had a magnificent view of the illuminated blue-hued domes of the New Cathedral. The next morning I ventured out in the rain to see both the New and Old Cathedrals and the Plaza Calderon, in the heart of the old city. The Old Cathedral is now a museum, and worth a visit, but I appreciated the architecture of the New Cathedral more. Later in the day, as the rain cleared, I embarked on a sightseeing tour via a double-decker bus departing from Plaza Calderon. I chose the southern tour route, which I highly recommend, as it includes the Mirador with its fine view of the city. The upper level of the tour bus offers an incredible view of the cobble-stoned streets and colonial architecture of the old town. Also not to be missed in Cuenca are the Panama hat factories, where you can watch some of Cuenca's more famous exports being made. I would have loved to have had more time in Cuenca. Logistics: The downtown section of Cuenca is pedestrian-friendly. There is a local sightseeing bus with regular departures from Plaza Calderon, offering tours of the northern and southern parts of the city. Easter 2014 we visited Santa Ana de Los rios de Cuenca (or Cuenca), the third biggest city, on a "round trip" in Ecuador, visiting Quito, Baños de Aqua Santa (or plain Baños), Cuenca and last but not least Galapagos. Traveling "avenida del volcanos" down south was great and the cities are exquisite. A hired car and driver gives a tremendous "freedom" on the road. We started our Cuenca-visit in fact before we entered the city with a visit to Ecuador's greatest Inka-ruin, Ingapirca. It's far from as great as the more famous Peruvian Inka-sites, but it's a "must-see" here. The local guide (it's mandatory) filled us in with a lot of interesting details of the "symbiosis" of Inkas and the more local Cañari. In Cuenca we connected with a Norwegian guide (Anne, who lives there and has been living there for 25 years) and that gave us first hand en effective insight to the city, it's history, culture, architecture, special buildings, it's people and of all Ecuador. In Cuenca round the main square, plaza Calderon, lies the town hall and the old and the great new cathedral. At the platform between the two the towers of the new cathedral it's a fabulous view. The church has room for 10,000 people. We pass through the flower market on our way to the Carmelite monastery where we just had to shop just to experience their odd way of customer-handling by not showing themselves! Passing through more markets we bought lama sweaters and blankets, also a "must do". The Panama hat has its origin here (and not in Panama). All workers at the Panama Canal wore such hats, and through plenty of pictures of the workers with their hats in papers round the world at the time the hats got the nickname "Panama hats", but it is the local Cuenca-indians who weave the strawhats and deliver the "raw hats" to the hat factory which do the blocking and finishing. Of course we had to obtain one. An interesting building was the "Dove house", a building that through restoration it was unveiled that most of the walls had great dove wallpaintings from the 17th century. A last "must do" was to have the local speciality for lunch, a guinea pig! It had to be pre-ordered because of preparing time, but it's really worth it! A crispy meat meal with tamale and other local side dishes. A fabulous meal! Our guide took us by car to the local surroundings, the four rivers, the oldest environment (the Barracanos), the local "Baños" (or bath) and the view of Mirador del Turi. After two days in Cuenca (and 9 days in the Andes) we depart for lower ground, Guayanquil and Galapagos. 3.0: Els Slots Tevity Jay T Don Irwin Michael anak Kenyalang Peter A.
Max Uhle: In 1923 Uhle excavated the ruins of "Tomebamba" the pre-Columbian city over which Cuenca was constructed. In particular he identified a part of the city built by the Incas after their conquest of the indigenous Canari and named "Pumapungo" ("Door of the Puma"). He attributed excavated buildings as e.g. The Palace of Huayna Capac. Legends and Folk Myths: Cuenca is considered a candidate for the mythical city of gold, El Dorado. Dubbed as another WHS: Named after Cuenca in Spain. Plus its Inca predecessor Tumebamba was dubbed second Cuzco. Built or owned by Germans: The New Cathedral was designed by Juan Bautista Stiehle, a German-born friar. 73 Community Members have visited.